LOS ANGELES (December 16, 2015) /MJbizwire/ – Med-X, Inc. (Med-X) today launched an equity crowdfunding initiative as the next phase in the company’s fundraising strategy. The company announced late last month that it had been qualified by the United States Securities and Exchange Commission (SEC) to sell shares to the general public through the Regulation A+ equity crowdfunding initiative, making Med-X the first company in the cannabis industry to be qualified by the SEC for a public offering under these rules. The company will be offering anyone interested in embracing the rapidly emerging cannabis industry, expected to yield billions annually, the chance to reserve shares early. Blazing the trail with research and development, agriculture, manufacturing and a media division, Med-X’s mission is to expand the medical and recreational cannabis industry by educating the community and developing products that are safe, effective and affordable. The company’s relationships in the medical and biochemistry fields give it the ability to position itself as a long-term player in the industry. 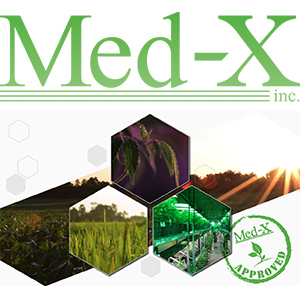 In February 2015, Med-X opened its first patient cooperative to cultivate 100% natural and organically grown medical cannabis for its research and development program. Med-X’s management team recognized a huge need to bring safe, medical-grade cannabis to the medical community that is free of pesticides, mold and other harmful substances. Medical cannabis dispensaries in California remain unregulated for the most part, despite cannabis’ use as a holistic alternative to pharmaceutical drugs. As more states legalize medical and recreational cannabis, cultivation centers are likely to face mandated product testing for potency and contaminants and, as a result, many will subsequently be forced to close if they aren’t complying. Med-X’s Nature-Cide product was created to solve the pesticide problem with all natural green solutions and is one of the first to market. Nature-Cide All Purpose Insecticide has been tested safe for cannabis cultivation, is EPA Registered nationally with the states which require registration and has been approved by the Colorado Department of Agriculture for use in cannabis cultivation. Individuals interested in learning more about the opportunity to reserve shares in Med-X can visit StartEngine.com. Med-X will be one of the first ten companies utilizing StartEngine.com. Med-X, Inc. is a Nevada corporation formed in February 2014 to cultivate and support the fast paced emerging cannabis industry through such activities as compound identification and extraction of the identified cannabidiol (CBD) compounds for the present medical industry demand. The company also plans to create and publish high quality cannabis industry media content through the company’s online media platform, www.marijuanatimes.org to generate revenue from advertisers as well as sell industry related merchandise to patients and consumers. The company is also gearing up to supply products to the cannabis agricultural and provisioning industries through manufacturing partnerships. For more information regarding Med-X, please visit www.medx-rx.com, email info@medx-rx.com or call 818-349-2870. StartEngine is the premier equity crowdfunding platform, connecting entrepreneurs and aspiring investors with tomorrow’s progressive companies. Based in Los Angeles, the company was created in 2013 by Howard Marks, co-founder of Activision, and Ron Miller. StartEngine aims to revolutionize the startup business model by helping individuals invest in private companies on a public platform for the first time in history, thereby helping entrepreneurs achieve their dreams. Learn more at http://www.startengine.com.